Oh wow! What is the the tentatively scheduled release time for this? 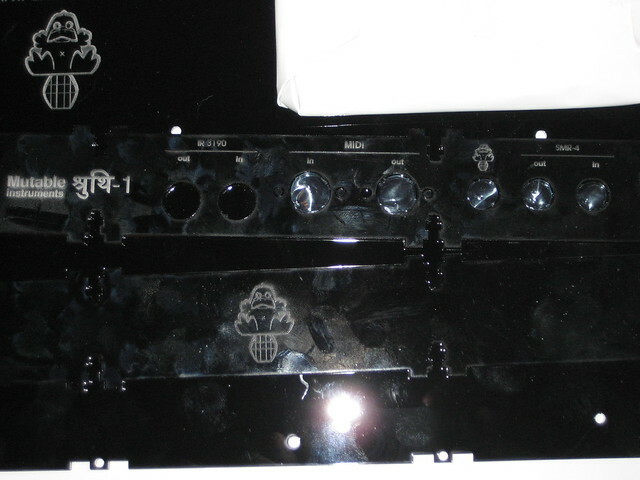 Will this be available as a kit, or will you supply PCBs and we are to take care of sourcing parts? Cheers. Yes, it will work without SD Card, just the boot time is a bit longer, but all buttons/LEDs are configured correctly by default. A kit won't be available, because the handling would be too time consuming. I will give a list of required parts and possible webshops. At least I now know it's some kind of wiring fault (hopefully :blush: ). I found a strange little quirk with my lpc1769 board......here are the details. If I do not seperate the two halves of the lpc board before placing it on the core board,the lpc will not boot corectly,I spent a good few hours looking for dry joints etc in the header pins to no avail. However if I twisted the board ever so slightly the thing would boot up....it turned out my fingers were brushing against J5 of the debugging board making the thing boot up.....confused is an understatement...lol. Anyhow I put my other lpc17 (already seperated) on the same core board and it fired up 10/10....hmm only difference was the debugging board was not attached to this one.......so I attached it via the sockets suggested at ucapps.....aaaaa progress...this board would not boot up with the debugging board attached either........unless I touched J5 on the debugging board. Took the debugging board from the new lpc17 placed it in the core and bingo....it worked. So,looking at the ucapps tutorial on the lpc17 it seems that I have done everything that I should have but it seems the debugging board has to be removed for the lpc17 to work........or as is usually the case have I missed something? Anyhow....all is good now but I thought this might save someone else a bit of hair tugging. To be honest: I remember that we had a similar issue on Christian's board and just removed the header between MBHP_CORE_LPC17 and J4 of LPCXPRESSO (the debug port), so that it has no contact. I'm unsure how I have to document this properly so that nobody else is blocked by the same issue. No worries TK.....it's all part of the fun. I can take some pictures but am not sure what you would like in them,let me know and I will take some. I'd like to throw up the first of many n00bular questions I'll have, bumbling my way through the v4l. Would it be possible to rig it up to be powered by maybe a 9v battery? I need my box to be super mobile, for the obvious purpose of sequencing in the forest. Imagine A1 and A2 are playing. A1 is set to midi channel 1, A2 to midi channel 2. You also saved previously A3 which was set to midi channel 3 and A4 which was set to midi channel 4. Now is it possible to switch the playback from A1+A2 to A3+A4? If you would setup your synthesizers in such a way, each using a different midi channel, you could use/trigger even 16 different synthesizers, all from a single mb seq v4l, of course only 2 at once at maximum. Internally 4 different patterns are running (stored in 4 different bank files), but the MBSEQV4L user interface combines these 4 patterns to a single pattern (at least you won't notice the split). Means: pattern changes always happen for both sequences to the same pattern number. If somebody prefers to switch pattern independent from each other (e.g. Seq1 plays 1:A1/2:A1 while Seq2 plays 3:A2/4:A2), I could add an option (e.g. configurable in MBSEQ_C.V4) to handle pattern switching based on the Seq1/2 button status (note that both sequence buttons can be selected at once). I find the current handling more intuitive since you don't need to take care to select both Seq buttons before changing two patterns synchronously. If a certain theme (e.g. played by Seq2) should be re-used in multiple patterns, just copy&paste it. 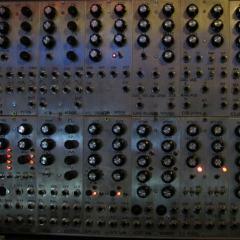 MIDI channels (and ports) are part of the pattern. The sequencer engine takes care that events (especially note off events) will be sent to the intended MIDI channel/port even after pattern changes and if the MIDI echo effect is active, regardless of the number of delayed notes. Imagine A1 and A2 are playing. A1 is set to midi channel 1, A2 to midi channel 2. You also saved previously A3 which was set to midi channel 3 and A4 which was set to midi channel 4. Now is it possible to switch the playback from A1+A2 to A3+A4? If you would setup your synthesizers in such a way, each using a different midi channel, you could use/trigger even 16 different synthesizers, all from a single mb seq v4l, of course only 2 at once at maximum. Does this mean the notes in Seq1 and Seq2 HAVE TO be always the same, currently? Different notes/CCs are stored in bank 1/2 and bank 3/4, but if your question was, if currently only the same combination of Seq1/2 patterns can be stored/restored, then my answer is yes. No, your design is good, as long as the notes can be different in Seq1 and Seq2, that's great. Triggering both always together is even better. Having a few more "shift" buttons would be interesting for future extensions, I was thinking of 5 buttons, one center button, around it four arrow buttons in each direction: up, down, right, left. Then you could use those, in all kind of combinations to access even more (future) functionality, e.g. various pattern saving/loading/changing functionality. The Firmware of the MB_SEQV4L is based on the SEQ V4 Firmware wich supports analog-out modules. I do not know if Thorsten left that part of program script in the V4L-Firmware. But I can imagine that he did. There are connectors (J19 as far as I know) on the LPC17-Core-Modul to connect analog out (cv/gate) modules. I do not exactly know the facts â€“ but I doubt that it is impossible and I think it will not be very difficult. that sounds nice. if this is posible it will be verry nice. Here ist what I call a minimum case â€“ in fact it is just a protection from above and from underneath. But it works for me â€“ thats all I want since I have already some Midi tools that look very similar, as you can see on the pictures. 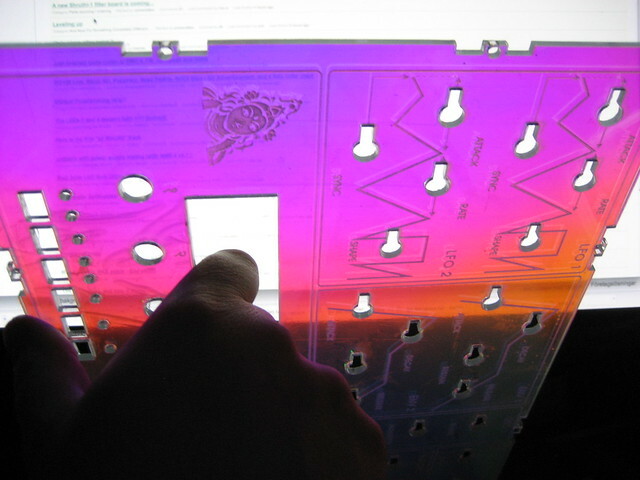 Those acrylic parts were manufactured by formulor.de, which ist the german version of ponoko.com. Look at the technical specefications of Formulor or Ponoko. The different colours mean engravings or cutting thru the material. If you know how to handle Corel-Draw or Adobe-Illustrator it will be easy for you to modify those files to build your own case and to modify the file the way you want it to get complete protection from the sides, the front and the back. Do whatever you like. The holes fit perfect. Maybe the holes for the switches could be a little bit smaller. I think I chosed 4.6 mm to be on the safe side. You can modify that as well, but make shure you don't touch the exact position! One more recommendation: Solder the transistors like I did: Bend them, so they lie flat on the face. That will provide the space needed to mount the front panel. The Micro-SD-Card Adapter sticks on the bottom panel with a double-sided adhesive tape. Here are some picture of the final result â€“ enjoy. Looking good! Wonder if I should Sammichize that case or not? Put some hex pattern on the side? Table-top sequencing fun for the masses. Who knew? Fantaastic work! nice done, thanks for the files. canÂ´t wait till we have the pcbÂ´s in our hands. I need to figure out a suitable height plus have some time off before something happens. Factory and packing smudge included :thumbsup: Guess I could wipe it, but nahh. nice work... if you could do this for christians frontpanel it wil be verry cool.